Embassy of India, Algiers celebrated Rashtriya Ekta Diwas (National Unity Day) on 31st October 2018. In the morning, Rashtriya Ekta Divas Pledge was administered to the Embassy staff by Shri Satbir Singh, Ambassador. 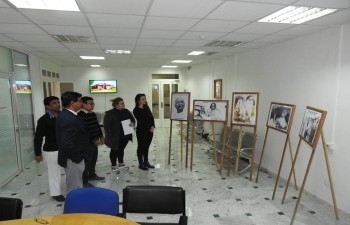 A pictorial exhibition on the life of Sardar Vallabhbhai Patel has been set up in the visitors hall of the Embassy. The video of the unveiling of the largest statue in the world ‘Statue of Unity’ by Prime Minister Narendra Modi and videos/pictures on the life of Sardar Patel were also screened on the occasion. A Quiz on the life of Sardar Vallabhbhai Patel was also organized for the Embassy staff.